The Tamayo transform fault is located at the north end of the East Pacific Rise where it enters the Gulf of California. 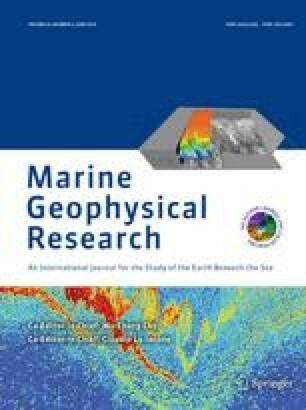 This paper presents bathymetric, seismic reflection, magnetic, and gravity data from a detailed survey of the transform fault. The dominant feature of the offset region is a bathymetric ridge trending 120°, parallel to the predicted transform plate boundary. This transform ridge is associated with a large (600 γ) positive magnetic anomaly, and a very small positive free-air gravity anomaly. Magnetic and gravity models indicate either a basalt or serpentinite composition for the ridge, but cannot distinguish between these possibilities. At its eastern end, the modern zone of strike-slip motion is in a narrow valley south of the transform ridge. The transform plate margin appears to pass through a saddle in the transform ridge and meet the western spreading center segment in the trough north of the transform ridge. On the basis of this survey and previous work, the history of the Tamayo from continental breakup to the present has been reconstructed. Initial rifting occurred along a trend of 130° at approximately 3.5 m.y.b.p. Once the transform fault was free of the constraints imposed by continent-continent and continent-oceanic lithospheric interaction, the trend of the transform fault rotated counter-clockwise. This rotation resulted in a ‘leaky’ transform fault and intrusion of a large continuous transform ridge. Further adjustments in the spreading center/transform fault plate boundary configuration have given rise to an incipient zone of rifting cutting across the transform ridge and emplacement of diapiric structures. Contribution of the Scripps Institution of Oceanography, new series.